Elaine Equi is almost impossible to categorize. While she verges on—and is in fact sometimes identified as—a language poet, many of the elements in her work are acutely lyrical, in spite of her assiduously dry, almost sardonic, tone. The poems in Sentences and Rain constitute a representative fusion of Equi’s language-conscious lyricism and her lyrically linguistic poetry. “A word can be a shriek/or a chrysanthemum—/barbed/or honeyed—/” writes Equi in the poem, “If I Have Just One Word.” Her words are almost always both barbed and honeyed, barbed with the subtle sophistication of a life lived in and through the dizzy post-postmodernism of the 21st century, honeyed by a unique literary and artistic sensibility and background. Equi’s work is nothing if not playful. Many of her poems appear sparse on the page with a quick-cadenced diction not unlike casual speech. White space is a trusted device for Equi. “Dear Ovid” and “A Medium-Rare Serenade,” wedding songs written for two different couples, are composed entirely of words made up of letters derived from the respective bride and groom’s names, a challenging feat which not only underscores Equi’s dexterity with language but highlights her intoxicatingly light touch. Equi is a poet of acute intelligence, an intelligence arguably mourning that “otherwise world.” This kind of meditation is, however, about as far into nostalgia as Equi will allow herself to venture. 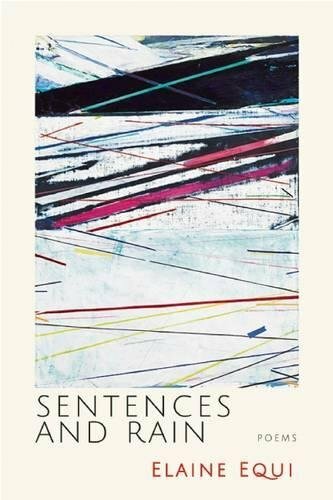 “The rain/waters/the sentences/” writes Equi in “Sentences and Rain,” a distinctly lyrical conceit, and one that echoes the poet’s fastidious commitment to language. Much good poetry has an underlying thread bordering on the nihilistic, and Equi’s work is no exception. Hers is the poetry not so much of empathy as of reportage, the poetry of what she sees and what she feels, delivered with dispassionate skill and a balanced delicacy of spirit. In the poem, “A Story Begins,” Equi notes that “We are the excess of the story— that which it cannot contain./” Because the stories cannot contain us, the writing itself cannot contain us, possibly because a good deal of who we are remains subsumed in that “otherwise world” of prelapsarian innocence and “uncontaminated” humanity. Equi explores and examines the human condition with a kind of detached exactitude, fully aware that some essential piece-part of the picture will always escape the poet’s eye—and pen. “Upper limit thought/” she writes in “Zukofsky Revision,” “Lower limit noise/” paraphrasing a Zukofsky quote. There is very little noise in these poems, and a great deal of seriously balanced thought. Occasionally these poems get a little cryptic; due in part to Equi’s laudable compression, but that does not appreciably interfere with the read. Equi is excellent at capturing the quotidian with its irregular rhythms and vague modernities, its attitudes, commentaries, and abbreviations. In “By the River of White Noise,” she writes of being “Transfixed by the babble/of whispered water —/its hybrid language/of natural and artificial/sounds . . .” This “babble” conflates past and future, sound-mixing them into the trance-like immediacy of the present tense. This sense of immediacy is exactly what draws the reader into Equi’s poetry. More than a recital of the poet’s inner states, much more than a recounting of her personal and/or family history, these poems, brief as they sometimes are, simply-stated as they almost always are, open up a ground, a web, of the conscious and subconscious dailiness we all experience but rarely self-examine or seek to understand. While the rain may well have stopped, Equi’s elegantly charged sentences will continue to reverberate in the mind and in the heart.